We have had a lot of changes ever the past year since I have been on my little blog. New city, new job, new home. But we did suffer a loss. Let's take a moment to pay our respects to the Great Glenwood. May she rest in pieces after her tragic and unexpected demise. I salvaged the furniture and accessories from the house. My favorite room was the kitchen. 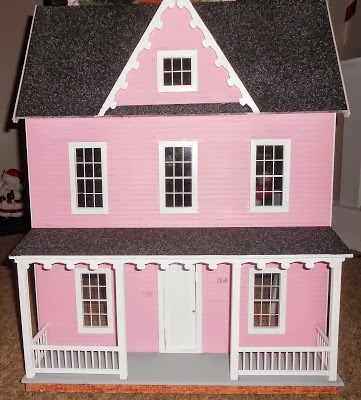 I have downsized my collection dramatically, keeping only one full scale dollhouse. This was not my favorite, but my Grandma made this and I won't let it go. Lots of work still needs done, but most of my pieces are secured down. I will be adding electrical to bring this house life. The living room as of right now. I have a rug packed away somewhere. Once we move into the house just purchased, I am sure it will show up. The false wall Grandma created makes the house easier to electrify. Plus I can use some of my exterior pieces as a view out the windows and doors. My plan was to update Grandma's wallpaper in the dining room. It is the only room that did not have staining and discoloration. It is ugly, but I am still debating if I want to replace it. Leon's Mansion has sat patiently for some attention. I painted the roof black in preparation for Krylon's Make It Stone spray paint. Still debating on how to finish off the flat portion of the roof. The tower it came with looks like a dunce cap. I ordered this little dresser from a shop on etsy. But I received this loot instead. The sender flip flopped address labels with the packages. I did the right thing and sent these treasures to the rightful owner. I have a order coming in for some papers to finish off the unfinished rooms. I would like my pieces secure in their homes before we move to the new house. This is not the new house, but was a float in the Christmas parade this year. It was the only one that caught my eye. This is the new place we will be moving into next month. 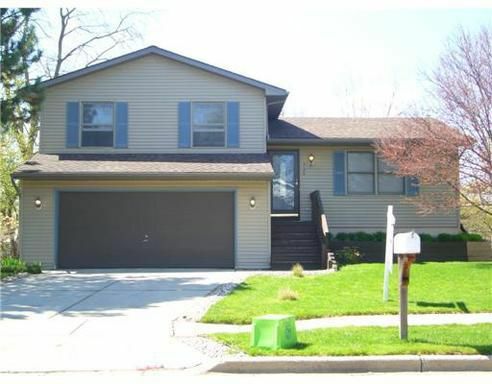 Nice and open quad level home, fenced in back yard for my daughter's dog she will be getting. Lilo, our 14 year old cat, has adjusted well to the temporary move. For Thanksgiving, my kids drove to New York for a week. I missed not having them, but couldn't let them pass up an opportunity for a sibling trip. They took this photo for me, framed it, and gave it to me for Christmas. Hopefully it won't be another year before I share again. Happy new year Audra. Looks like it has been a busy time in your world, but the new home looks lovely. And your grandmother’s dollhouse too. Take care. I think that you've done the right thing about keeping the house your grandmother made but it's a shame that the Great Glenwood is no more, but that's life isn't it? Ok it is time for me to get cracking. You have truly inspired me! 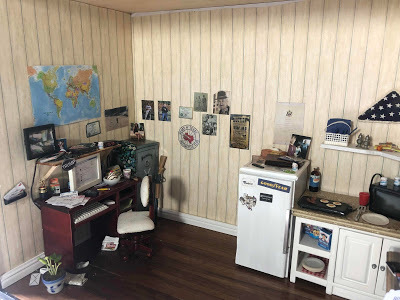 That little dollhouse is adorable! I would love to know more about the float. Who sponsored it and why a house? A Trio Of Very Different Overmantel Dolls House Fireplaces! The Most Amazing Triang Toy Collection! At least it's sunny indoors! Well this sure tests one's patience! Miniaturas, vivir en otro mundo " La Cueva De Cyberarpía "
Pink Barbie House Rehab: Done! Spring has sprung here, finally! It's a matter of time, we always get lost..
im back! but to what?? The good, the bad, the ugly, and the beautiful! Switching back to WordPress..Hope to see you there! !